WASHINGTON, D.C. — One way to restore offensive punch to the surface Navy is to discard the idea of Outer Air Battle to defeat a Soviet Cold War fleet in the Mediterranean and Baltic Seas and the North Atlantic and concentrate on dense air defenses 30 nautical miles out. Bryan Clark, a senior fellow at the Center for Strategic and Budgetary Assessments, said the idea then was, “going after the archer before he could shoot his arrows,” speaking Wednesday at Capitol Hill. Today, “we could not execute Outer Air Battle” for a host of reasons: U.S. ship missile defense ranges are less than the attacking missiles’ ranges and an enemy is capable of overwhelming existing defenses by launching hundreds of missiles at a time from ships, submarines and aircraft. In releasing the center’s “Commanding the Seas: A Plan to Reinvigorate U.S. Navy Surface Warfare” at the event, he added the Navy likely would no longer be in an ancillary role to the main engagement as it was in the Cold War. In short, in a potential engagement with China or Iran, the aircraft carrier and its air wing would be in a power projection role and unable to provide the kind of air defense, including targeting, the Cold War plan envisioned. Clark called the center’s recommendation calls for a “much denser” than the layered approach. In the Outer Air Battle, the idea was to fire the most expensive longer-range missiles first and then missiles with shorter ranges. “It also would be bringing in new capabilities like electronic warfare and integrating new capabilities like lasers and rail gun. Now, they would be used as backstops” to destroy “leakers” that penetrated the first layers of defense and were about 30 nautical miles from a ship. He said this new approach also would “improve the cost exchange between U.S. air defense and enemy [anti-ship cruise missiles]. “We would be using SM-6s to shoot down airplanes not cruise missiles,” he said. 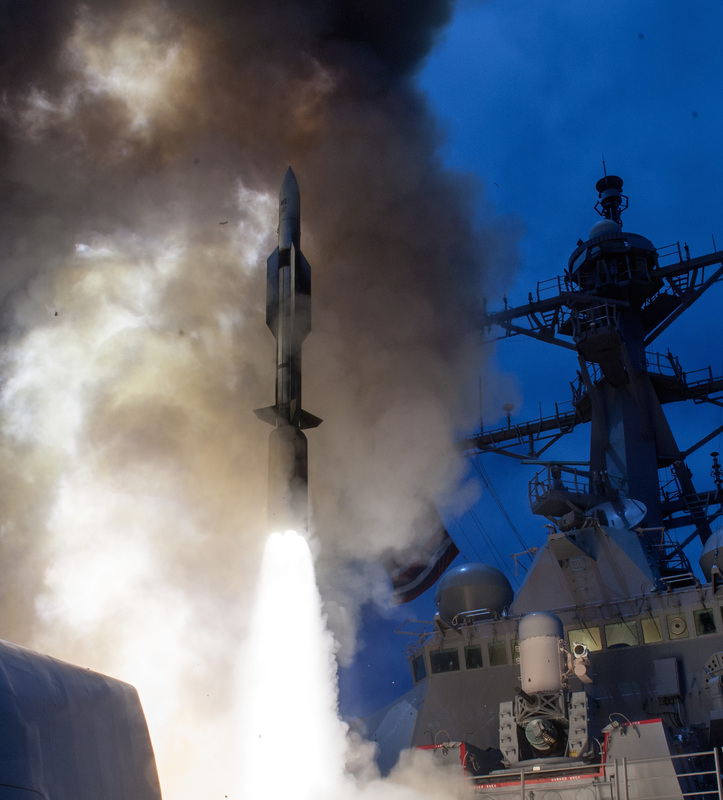 An added benefit would be to introduce these weapons between now and 2025, the outer limits of the center’s study but still five to 10 years ahead of the Navy’s current plan to build a new surface combatant. The report recommended putting lasers aboard DDG 51 Flight III and rail gun on some additional Joint High Speed Vessels and the three Zumwalt-class DDG 1000s. “Why not do that now?” Clark, a retired Navy officer, asked rhetorically. The report noted that these weapons and the long-range anti-ship missile, surface warfare improvement program (SEWIP) Block 3 and Air and Missile Defense Radar (AMDR) are expected to be fielded by the mid-2020s, also the time when the Ohio class ballistic missile submarine begins making its largest effect on the shipbuilding budget. He added that the shipbuilders who now produce the Littoral Combat Ships (LCS) said they could install vertical launch systems on the small surface combatant with work in starting 2019. Yesterday in a meeting with reporters, he said he would install VLS on existing Littoral Combat Ships when the final design for the small surface combatant is approved. Defeating does not necessarily mean destroying the platform itself. Clark said by reducing payloads and size of warheads existing missile ranges would increase. A lighter missile could take a ship out of action in a “mission kill” by destroying its radar or some other capability it needed to fight effectively. Clark said the Navy is already making decisions on how it will modernize its existing ships and introduce new weapons to the fleet. He said the report’s recommendations build on that work and realize the fiscal constraints the department is operating in now and likely to 2025.